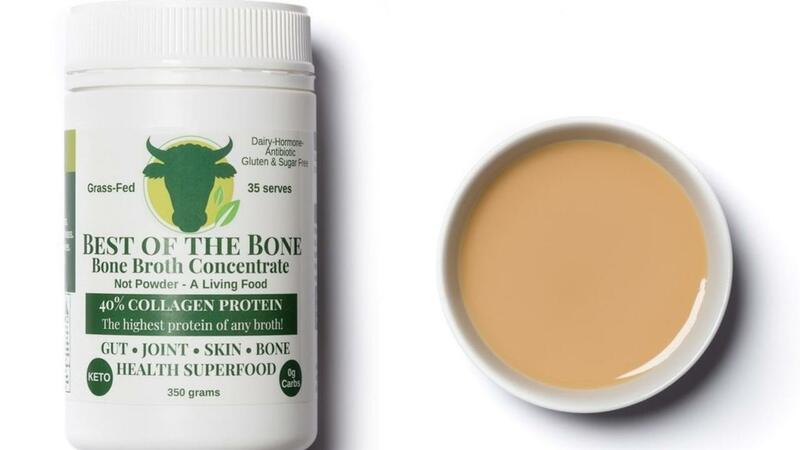 Best of the bone grass-fed, slow-cooked 48+hours beef bone broth concentrate - collagen protein. A gut health superfood (not powder) - a living gelatin. The richest, most nutrient dense slow-cooked (for 50+ hours,) certified grass fed bone broth gelatin (NOT powder but a living, enzyme and nutrient rich gelatin) - is packed with the most absorbable collagen protein, 19 vital amino acids and minerals. A delicious Italian Herb and Garlic grass-fed bone broth gelatine packed with bone broth protein (NOT a powder but a gut-healthy, living, enzyme and nutrient rich gelatin) - a highly absorbable collagen protein, 40% collagen, packed with minerals including magnesium, phosphorous, sulfur and calcium; and with 19 critical amino acids known to improve gut, joint and skin health. Grass-fed bone broth gelatin concentrate with bio-fermented coconut - lemon myrtle - papaya leaf - turmeric. A new, one-of-a-kind gut health bone broth powerhouse with 25 billion good bacteria per serving. Meaning a probiotic powerhouse teamed with the marrow-rich prebiotic, ketogenic gut healthy Best of the Bone for a new super digestive food. Best of the Bone for Dogs, a grass-fed liquid beef bone gelatin, provides dogs with the highest levels of collagen protein available in any food. The beef bone gelatine is high in 19 amino acids that your dog needs for complete health. Sounds like a GREAT DEAL right? !